World Post Day is celebrated each year on 9 October, the anniversary of the establishment of the Universal Postal Union in 1874 in the Swiss Capital, Bern. It was declared World Post Day by the UPU Congress held in Tokyo, Japan in 1969. 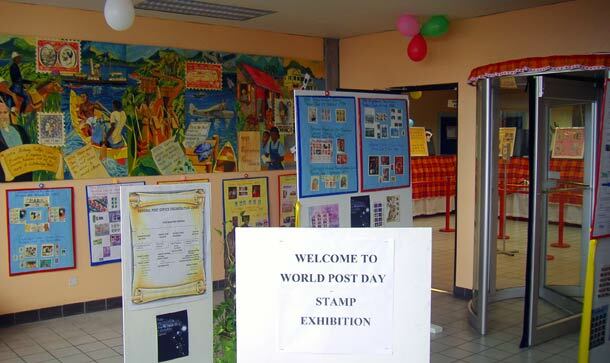 Since then, countries across the world participate annually in the celebrations; and to commemorate World Post Day in Dominica the General Post held a one day Stamp Exhibition. On exhibit was variety of Dominica Stamp Sets, ideal for stamp collectors, historical Postal equipment (i.e. historic letter scale), and also on display were stamps collections from different countries. In contrast, I found the Stamp exhibition to be quite informative â€“ I learned a lot about how the Post office operates and the different challenges theyâ€™re facing with technological crimes. Here are some shots from the exhibition…enjoy! After an hour of fruitless searching I cannot find the link or URL for the Dominican postal service’s website. I have a keen interest in Commonwealth Caribbean states and their stamps. Any suggestions?